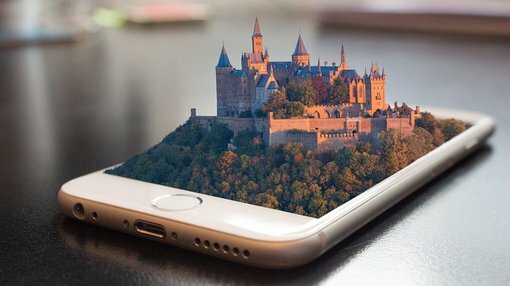 The five largest companies on Earth are technology companies. Never before has this level of market influence been seen from just one sector, and from a handful of companies. What’s more astonishing is the rather short period of time taken to achieve such largesse. 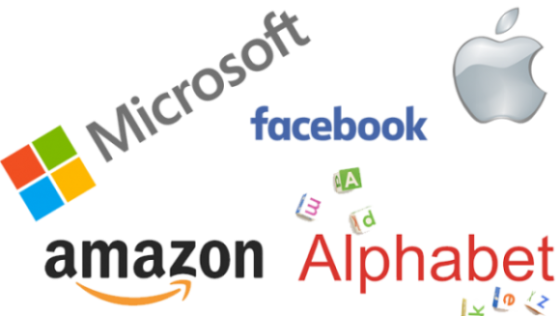 The US-born, but now global, tech giants of Apple, Alphabet (Google’s parent company), Microsoft, Amazon and Facebook, are the five biggest companies in the world by market capitalisation, netting a combined US$2.2 trillion in market value. Of course as with any investment there is still inherent risk in these companies and investors should seek professional financial advice if considering these stocks for their portfolio. Their increasing dominance is fueling concerns about customer security and data privacy, not to mention the potential effects on anti-competition, anti-trust, tax avoidance and conflicts of interest issues. Shares in Amazon and Alphabet raced passed the $1,000-mark this month, the latest sign of the companies’ growing might. Google is expected to attract more than 40% of digital advertising spend in 2017. Amazon is on track to collect half of US online sales by 2021. Facebook accounts for over 20% of total mobile internet traffic, and ushers more content through its servers each year than has been created by humankind in its prior history. Microsoft’s products, in one form or another, lurk in over 70% of PCs, mobiles, tablets, cloud servers and corporate networks. Tech companies make routine buyouts of other, potentially competitive tech firms, at huge multiples and often for billions of dollars. Last year’s announcement of Microsoft buying LinkedIn (a social media platform for professionals) for $26 billion, shows just how high (and large) the stakes are for this new generation of corporate giants. It used to be mostly banks and miners that wielded such largesse in market capitalisation, but not anymore. Apple’s fiscal results for the fourth quarter ending September 2015 revealed revenue of $51.5 billion, an increase of 22% from last year’s fourth-quarter revenue of $42.1 billion. Alphabet, the parent company under which Google operates, owns all of Google’s side projects, such as life-extension company Calico, innovative technology developer Google X, high-speed Internet provider Fiber and Google’s smart home project Nest. Microsoft was founded in 1975 and launched Windows 3.0 in 1990. Microsoft employs close to 116,000 worldwide and posted annual revenue figures of US$93.58 billion and net income of $12.19 billion last year. Facebook services around 1 billion users every day. The mass of data it has on users is attractive to advertisers, who pay handsome sums to direct targeted messages at their desired audiences with greater precision than they would have through traditional media, such as TV. Facebook has grown at an exponential rate since its birthday in February 2004. Facebook acquired photo-sharing platform Instagram in 2012 and acquired messaging service WhatsApp for $16 billion in 2014. Amazon is an e-commerce giant, serving millions of global customers through its online marketplace. Amazon has added to its huge retailing unit, by introducing content streaming, music and video subscription services and cloud-based features. Its most recent innovation is Amazon Go, a service feature which hopes to fundamentally “transform the retail world”. The system aims to make stores cashier-free by introducing a new self-check-out mechanism. The engineer behind Amazon Go (Bali Raghavan), describes Amazon Go as a combination of sensor fusion, artificial intelligence and machine learning that automatically detects when products are taken from or returned to the shelves and keeps track of them in a customer’s virtual cart. The other big news from Amazon is its pending acquisition of Whole Foods for $13.7 billion — a move that is likely to stretch Amazon’s influence into the perishables markets of food and beverages – as well as the hotly anticipated arrival of Amazon on Australian shores. This acquisition is yet to occur, so investors should not base their investment decision on this information alone and should take a cautious approach to their investment decision. These firms gain power as they amass user data and shape the flow of information, controlling consumer access to the firms using their platforms. By becoming both the gatekeepers to e-commerce and tech revenue, as well as the catalysts for any new budding tech players, the top 5 tech firms have grown into corporate juggernauts within the space of two decades. Cast your mind back to the early 2000s and the dotcom bust – at that stage, the top 5 tech companies featured in this article were relatively small in comparison to today, exercising barely a whiff of the influence. Back in 2000, only 10% of people had access to a PC or a mobile phone; today that figure is somewhere close to 90% in developed countries. Such growth, in such a short time, has attracted the interest of regulators keen to restrain alleged rampant abuses of customer privacy protections and anti-competition laws designed to restrict runaway monopolisation. Even Donald Trump has waded into the issue of tech dominance. Earlier this year, Trump described Amazon as a monopoly and said its boss Jeff Bezos had a “huge antitrust problem“. Critics have said taking a tougher line on mergers and acquisitions won’t necessarily be enough to combat the rising power of giants like Amazon. And it would seem this has been borne out in recent years, with a generation of companies growing predominantly on the back of ‘value accretive acquisitions’ rather than through organic growth. In 2013, the European Commission fined Microsoft for giving preferential treatment to its own browser, Internet Explorer. This year, it fined Facebook for providing “incorrect or misleading” information during its acquisition of messaging service WhatsApp. 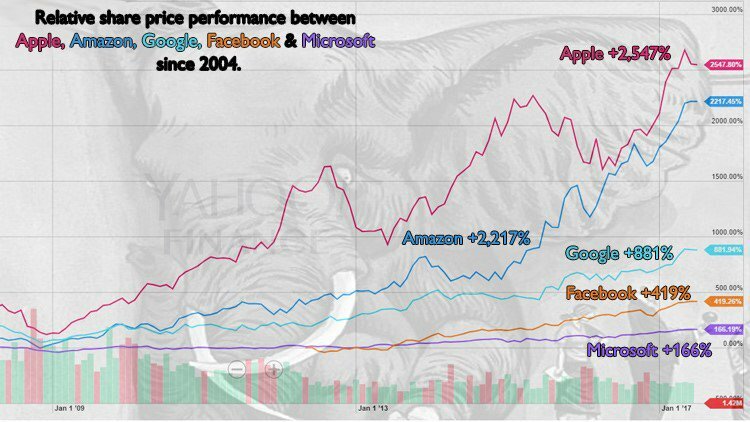 Aside from some fines and critical commentary, the growth of the tech giants continues. The recent dramatic increases in share prices could be why some investors are underestimating the likelihood of regulatory action, or quite possibly, downplaying their ability to restrain the runaway Tech Locomotive. In the world of corporate business, rapid expansion remains the default target of choice, and it seems it’s the tech companies that have found the winning formula. Regulatory agencies from around the world have a huge task on their hands. Regulation is national, but the top five tech firms operate globally. Regulators see consumers on a national basis, but there is nothing to stop Aussie consumers paying for US-sourced content, sold by a US tech firm. National regulation involves touchy subjects like national borders, tax rates and various legislation that is designed to protect national interests, rather than preserve efficient competition. Regulators are desperate to put a lid on the insatiable growth of large tech firms – but in reality, there is very little they can do to stop them. The fundamental reason is that most consumers care more for the content or service they pay for than the potential hazards of just five global giants supplying it to them.